Benjamin Franklin famously said the only two things about which we can be certain are death and taxes. If he were alive today he might be tempted to add pensions crisis as a third certainty of human existence. I wrote my first “pensions are in crisis” article (for this newspaper) more than a decade ago. That is not a claim to successful futurology or deep insight. It was merely an observation of an existing state of affairs. It was also something that pension experts had been warning about for a long time. Attempts have been made to make things better but these have mostly been piecemeal. Of course, with regard to the National Pension Reserve Fund, it was a case of one step forward and then fall off a cliff. Many pensions are still in crisis, both public and private. The list of culprits is a familiar one: we are living longer. In particular, we are living longer than expected by the actuaries who set up the pension schemes in the first place – yet another example of the futility of forecasts. Investment returns have also, in many instances, been lower than forecast. The ending of company defined benefit schemes has also created more problems than it solved. All of this is standard stuff. The response of pension experts is always a rational one: above all else, we should be saving more for our old age. The action taken by most of us is often to yawn and pay attention to something more interesting. Like slowly boiled frogs, we do nothing as the problem builds. Curiously, unlike boiled frogs, we know what is happening and why. We also know what to do to escape the pensions dilemma but mostly choose not to. This is where it gets interesting. The pensions industry yells louder at everyone to save more. During good times and bad times, the experts are mostly ignored. It’s not just about the recent recession leaving no money left over for saving. When things were booming we saved more but still nowhere near enough. All of these remarks apply to many economies, not just Ireland’s. We are uninterested in our pension arrangements. Attempts to persuade people to do something often fail. Perhaps it is time to face up to this and acknowledge the consequences for public policy: a lot of people are going to be very disappointed by their pension entitlements. State pensions will remain a significant part of old-age income. This, in turn, will generate another fiscal crisis, sooner or later. 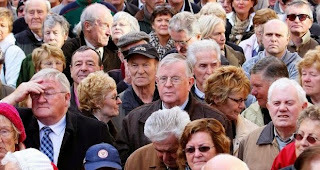 The political power of older people is growing in line with their numbers. Few politicians are willing to antagonise a most important bloc of voters. It seems to be easier to cut public sector pay than to take on pensioners. Nobody dares tackle existing benefits, some of which are as daft as they are unaffordable. Journeys on the Aircoach from Killiney to Dublin Airport are illustrative. The conversation is often about overseas villas and the latest cruise. These well-heeled pensioners are travelling to their holiday destination in leather-seated, free wifi luxury at the expense of the taxpayer. It really is quite an experience. Free travel for all is just one indefensible, unaffordable benefit that, I forecast, will never be tackled. I am not going to mention healthcare spending for fear of what will happen to me the next time I am on that bus. It is tempting to say I must be wrong: a future financial crisis will force politicians to do the right thing and sort out pensions and unaffordable entitlement spending. But we have just lived through the worst financial crisis of all time which left many “unsustainable” benefits untouched and did little to sort pension arithmetic that doesn’t add up. These are battles that seem to be too hard, politically, to fight. Future governments will be faced with a paradox: the ever-increasing power of pensioners will lead to ever-decreasing willingness to tackle unaffordable spending commitments. But those older people will be growing more and more disgruntled with their pensions. There is no doubt in my mind the global pension crisis is getting worse and that along with the jobs crisis, these will be the political issues of the next decade(s). The author is correct, this isn't an Irish problem, it's a global problem and quite amazingly, it's a topic that receives little if any attention because most people just prefer to ignore it until it's too late. What happens when it's too late? As an extreme example, look at Greece. Their pensions are on the verge of collapse and the country's left-wing leaders are desperately trying to negotiate terms to save them. But as Greece searches for a new deal, the reality is that its economy is in a dire predicament because decades of public sector profligacy have finally caught up, and the math simply doesn't add up. On Grexit, he doesn't think it's going to happen. Instead, he thinks Syriza will eventually cave and the ECB will take over the IMF loans to Greece (about 30 billion euros) and then Germany and other creditors will put the screws on Greek leaders to reform their economy once and for all (I certainly hope he's right). The first month of quantitative easing (QE) has come and gone. Although early indicators are positive, it will take some time to tell whether QE will ultimately lift the euro zone out of its economic malaise. But the immediate impact of QE on defined benefit (DB) pension schemes is clear, and it is creating huge challenges. QE has dealt Irish DB pension schemes, which are facing exceptionally low interest rates, yet another blow. The €60 billion per month of bond purchases in which the European Central Bank (ECB) is engaged is distorting an already stressed market very significantly. Although QE has boosted asset returns, the considerable associated reductions in bond yields have pushed DB liability values to ever-dizzying heights and reduced expected returns on asset portfolios. This brings further massive financial reporting pressures for plan sponsors, who are committed to delivering pension benefits to their employees. QE has likely already increased the value of Irish DB scheme liabilities by up to 20 per cent (ie by between €10 billion and €15 billion across all plans), making an already difficult situation at the end of 2014 considerably worse. Yields on long-dated German bonds have now fallen below zero at maturities up to just under 10 years. As a result, local insurers are or may soon be pricing annuities at negative interest rates, resulting in the rather bizarre outcome that it may cost more than the sum of expected future payments to buy out a pension benefit. For schemes that are required to reserve to this level under the local regulatory test, this provides significant funding difficulties. For schemes in wind-up, it may result in an even more unfair distribution of assets from the viewpoint of non-pensioners. The concept of building a regulatory funding hurdle around what is a very uncompetitive annuity buy-out market in Ireland remains a concern. This has not been adequately alleviated by the advent of sovereign annuities, which remain a relatively unused and unwieldy solution. How should trustees react to these QE-related challenges? First, they need to realise that QE will not be permanent. It is scheduled to run until September 2016 and although it may be extended beyond then, there are some challenges in upsizing the programme. As a result, the current issues, although extremely challenging, may be temporary. Second, they need to be aware that QE has provided massive support to asset prices but that this support will not be permanent and, at some stage, assets will have to stand on their own feet. Third, they need to treat with caution the Pensions Authority’s position that bonds are the optimum investment class. In its 2014 annual report, it expressed concern about the level of investment risk to which Irish DB pension schemes are exposed. Risk management and diversification away from volatile equities should certainly be encouraged and supported. However, now is a very expensive time to reduce risk by increasing allocations to euro zone bonds. De-risking in this form, while QE is influencing the market, will likely have a permanent impact on pension benefits (through benefit reduction or a forced move away from DB schemes). The regulatory framework should ideally take account of the unprecedented market conditions Irish schemes face due to QE and allow schemes that are well managed, have defined risk management strategies and are sustainable over the long term to navigate the current short-term challenges. Accordingly, it falls to trustees and sponsors to make sensible risk management decisions and do their best to plot a course for the long term while managing short-term financial challenges. I'm not so sure this is a temporary problem. If anything, my fear is that Euro deflation crisis will get worse as politicians there keep putting off major structural reforms, forcing the ECB to take on more expansive and aggressive quantitative easing in the future. This is why I don't agree with those who think now is the time to short the mighty greenback. Although I understand why Stan opted to take a lump sum pension payment, I don't share Garth Turner's enthusiasm for this option as it places the onus on Stan to invest that money wisely and make sure he and his beneficiaries don't outlive those savings. He's probably going to invest the money in some crappy "balanced" mutual fund which will underperform the market and get eaten alive on fees. Even if he invests wisely in dividend staples like Bell Canada and those much loved Canadian banks which I'm shorting, he might live through another financial crisis and take a huge hit at a time when he needs stable income during his retirement. As you can see, when it comes to retirement policy, Garth Turner is just as clueless as his Conservative buddies in Ottawa. If they had any policy sense whatsoever as to what's best for Canada which is about to go through a major crisis, they would have enhanced the Canada Pension Plan for all Canadians by now. Instead, they will increase the TFSA limit to help rich Canadians, which is just another dead giveaway to the financial services industry. So, if you ask me, Stan is right to worry as the burden of retirement falls entirely on him now, but he should focus on his health first and foremost, and worry less about his retirement savings (retirement anxiety is bad for your health, another reason which is why I prefer DB plans!). As for others living in Ontario, there is hope as the provincial government recently passed legislation to create a provincial pension plan for more than three million people who do not have a workplace pension, despite critics' warnings it amounts to a job-killing payroll tax (they are clueless too!). When it comes to the pension crisis, Ontario is wisely bypassing the feds and going it alone. I can only hope other provinces will follow its lead because the pension crisis isn't going away in Canada and elsewhere. It's only going to get worse, forcing politicians to take some very tough decisions down the road. I just hope they take the right decisions, not the politically expedient ones which will exacerbate pension poverty. Below, as wide differences over pension and labor reforms continue to dog intensive negotiations between Greece's leftist government and its international creditors, Steen Jakobsen, chief economist at Saxo Bank, tells CNBC the country will eventually face bankruptcy. As far as I'm concerned, Greece is already bankrupt -- financially, ideologically and morally bankrupt -- and the sooner they kick the clowns running the country out of office and introduce real reforms, the better off its citizens will be. Lastly, Bill Gates, Warren Buffett and Charlie Munger talk about ultra low rates all around the world and how they pose leverage and bubble risks. In my opinion, there's no conundrum, the world isn't prepared for global deflation, but bond markets are worried about it.